With the rise of smart watches and bracelets, the applications that monitor our physical activity are experiencing a strong growth. The market offers a wide variety of both paid and free choices, and it is not always easy to choose the best suited to our needs. There are some basic points that all of them share (like measuring the number of calories burned, the average speed , the distance traveled, etc. ), but each one offers a unique look and extra features that makes it better or worse to our preferences. 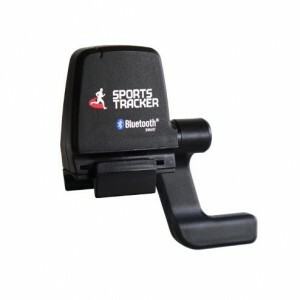 Along with Runtastic, Sports Tracker is currently one of the most popular applications available on the market. That reputation is well deserved. Sports Tracker is a complete and free mobile application that continuously keeps a detail record of our training sessions. It follows a style similar to other apps in the sector, as Runtastic or Endomondo Sports Tracker, recording our physical activity with great detail. It is mainly focused on fitness, but we can also configure other sports. Sports Tracker monitors all our behavior during the training and provides the information in the form of statistics and graphics. The information is available at all times, and we can live values of our average speed, maximum speed, total distance traveled, etc. It has a pause mode for those times that we have altered our physical activity, either because there are a stoplight or because we stopped to drink water. It also provides useful information such as the time of sunrise and sunset, so we can schedule the session to run avoiding the hottest hours of the day. 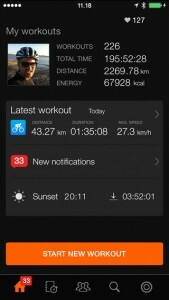 Sports Tracker is an application designed to share the trainings with our friends. It offers a lot of possibilities to share the results of a training session, the averages or even the photos that we can take during the physical activity. These pictures have automatically stored the information about its location. 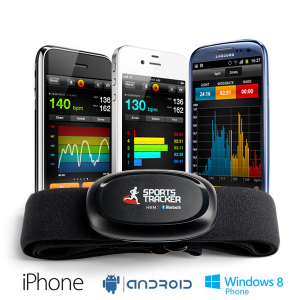 Sports Tracker is available for free for the three major mobile platforms: Android, iOS and Windows Phone. The company also offers a couple of interesting accessories that are sold separately. If we want to monitor our heart rate, Sports Tracker has a heart rate meter attached to a strap that we wear on the chest. It communicates with our smartphone via Bluetooth, and is compatible with iPhone 4S/5/5S/5C and Android 4.3 and higher devices. You can purchase it in their web store for $79.99. The other device of the the company that can be attached to the app is Sports Tracker Speed and Cadence sensor, an ideal complement if our sport is cycling. This sensor is able to provide continuous information on our rhythm and cadence when we are on the bike. 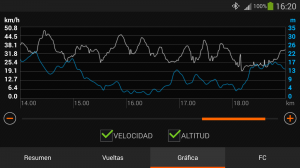 Thus, we can know the performance at all times while we are cycling and optimize to the training accordingly.